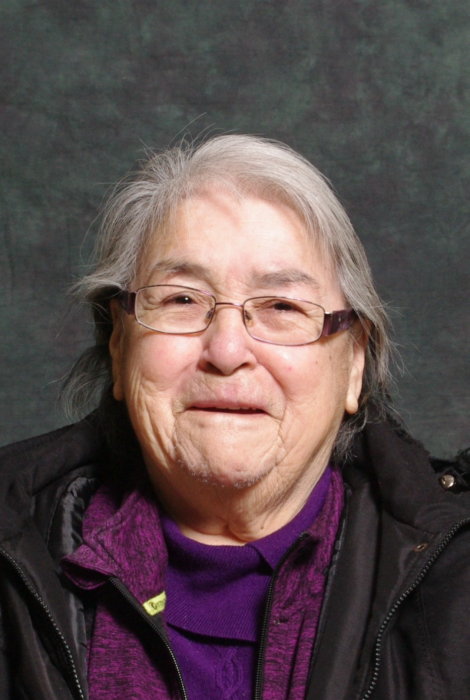 With heavy hearts the family of Edna Ahenakew announces that she passed away on Thursday, January 31, 2019 in Prince Albert, SK. Edna will be lovingly remembered by her children, Lawrence (Mary) Ahenakew, Lewis (Lori-Ann Bird) Ahenakew, Larry (Iona) Ahenakew, Darcy Ahenakew, Marlene Ahenakew, Dale (Dean Campbell) Ahenakew, Eric (Ruth) Ahenakew, Marvel (Steven Pijnenburg) Ahenakew, Roger (Dawn) Ahenakew, and Vanessa (Danny McKay) Ahenakew; 29 Nosimak and 40 Capanak; her brothers and sisters, Hillard Williams, Helen Albert, Roy Williams, Eileen (Ron) Paul, Derek (Linda) Williams, Vivian Knife, Johnny (Eldeen) Williams, and Jimmy Williams; her in-laws, Wilna Nesland (née Ahenakew) and Barry Ahenakew; and special friends, Rosalie Genereaux and Delores Benjamin, the Anglican Church Women’s group, and all her sewing friends. She was predeceased by her beloved Husband, Chester Ahenakew; her children, Janet Lucille, Fenton Neil, and Marmy Dwayne; her parents, Jacob and Gladys Williams (née Little); her grandparents James Williams and Louise Netmaker, and Charles and Elizabeth Little; her grandchildren, Clyde Chester Joseph, Noah Keely and Amori Rose; her in-laws, Walter and Rachel Ahenakew; her sisters, Bernice Sanderson, Hilda Williams and Verna Williams; and her brother; Edwin Williams. The Wake Service will take place at 4:00 p.m. on Saturday, February 2, 2019. The Funeral Service will be held at 11:00 a.m. on Monday, February 4, 2019. Both services will take place at the Ahtahkakoop First Nation Band Hall.